Beautiful! What a wonderful story! I hope that there is another in the works. Aww, yay! I would have never seen that ending coming, but it's perfect! It almost feels like a prologue now. Ah, well, the best stories always leave you wondering what happens after the tale ends. Thank you very much for telling this fantastic tale! I hope we will see much more of your art. Also, I really liked the fact that there are sketches. They have such a nice feeling to them. Thank you so much for sharing your work with us! It has been one of the things I look forward to the most this week. It has been fantastic. Thank you for sharing your story. It was lovely and looked beautiful. I too enjoyed that they were sketches. How did Tearse avoid the flames Viperal shot at him at the end? Was that his own powers, or did Kyte help him out? And how old are Tyler, Elsie, and Kyte? I've been trying to figure it out and I'm still not sure. I was also so sure there would be a love interest for Elsie somewhere in there, but oh well. I can't believe it's over! I've been following WD since the beginning, and my weeks just aren't going to be the same without it. It's been a great year+. Thank you so much for sharing it with us all! I know you consider this novel to be unfinished, but for me, the uncolored pages didn't diminish the experience one bit. Your pencil drawings have an energy and expressiveness that's incredibly rare and amazing to look at. I love your painted works too, but your line art is what caught my eye when I first discovered your blog. I hope you'll continue to post both styles! Like the rest of your readers, I'm very much looking forward to your next story. In the meantime, I'm going to go back and read WD (and all the reader comments) again from the beginning! Thank you so much for posting this week by week, as a sort of gift to readers. It's been a joy to read, especially in sketch form -- so loose and emotive. :) Thank you, again, for posting, and I look forward to anything you do in the future. I really liked the relationship between Elsie and Tearse. Please make a sequel! There's enough scope! ..It was the thing to look forward to mondays!! Sarah: Congrats on this story! It's a huge achievement to be able to have created something like this! The story was fantastic, and I really enjoyed reading every week. Thanks for posting your unfinished work, too.. It really was great to see your sketches and how you start.. not to mention falling in love with these characters! Thank you so much, your graphic novel sequences made my weeks. This was one of the best series I read online this year. Bravo and absolutely terrific work, Sarah! Ahtna - Thank you, Ahtna. I too like stories that end with a sense that the world and the characters keep moving forward, have new adventures, etc. I also wanted Tearse's redemption to be something he'd have to commit to in a long-term way. Toria - I'm glad that the identity of the one came as a surprise. It was a definitely a challenge... making it believable in retrospect that it was that character all along, but not giving it away too early in the story. I'm also glad that you saw the ending as happy/hopeful. I never really was a graphic novel person either, although I've become more interested in them in the recent past. I think for me it just made sense to attempt one, I love to draw and I love write. I had no idea how long it would take, though! scylla's revenge - I like to think Elsie and Tyler would have a good reason to come back someday. It's just too sad to think that they all never see each other again. No plans for a sequel at the moment, but I've love to eventually write one. I'd love to know what happens on that ship with Tearse and Jase. I can't imagine that they are the best of friends yet. And yes, it was Kyte who saved Tearse. I think after healing himself, which couldn't have been easy, he was waiting for an opportunity to safely attack Viperal. It was risky to step in and save Tearse, but Kyte's a good guy, and couldn't watch Tearse die after sacrificing himself in an attempt to give Elsie time to escape. I'd say Tyler is nine, Elsie is thirteen/fourteen and Kyte is fourteen. I think Kyte would have been a love interest for Elsie had she not been stuck on the island for the whole story, which is hinted at a little in the end. And I'm sure Elsie wished Tearse was her age, before she realized he was lying to her. I really enjoyed this story from start to finish. Congrats on getting to the end! what a wonderful story - beautifully written and exquisitely drawn. I hope that you will finish it someday and publish, it is a story I would like to share with my toddlers when they are older. I can't tell you how much I have enjoyed your talent and artwork. Best of luck with your current projects, I'll check in from time to time to see what's new! Thank you for this awesome story! The ending did come as quite a surprise - not that I expected a happy end, but rather that some of the most important stuff got wrapped up so fast. But then again, that's exactly what happens in reality & I have hated other authors before because they simply couldn't get passed 'saying goodbye' to their characters. Short pain is better I guess. I came upon your novel on the recommendation of a friend and I've been blown away by the quality of both the drawings and the storyline. I found it easy to immerse myself in the characters' world; everyone felt so real. Thank you so much for sharing this with us. I hope you have the opportunity to publish in book form some day: I'm a great fan of graphic novels and I'm sure that this one would be a huge success. Good luck! Sarah, it was so inspiring to see your story unfold; I found your website about a month ago and read up unto the part where Jase was leading the army up the hill for the battle; I was so excited to see the last few sequences unfold on a weekly basis. I love your created world - the social hierarchy of the Mants & Sprites, the faith based culture with the Priest Elites, and a realm of interesting characters to capture your heart. I wondered if the characters related to people in your own life that were given new names but had similar character traits? I have made several sketchbooks from my travels to Italy and from architecture school in college, but never written anything like a graphic novel story; in fact, my favorite part of reading The Wellington Division was it was written with sketches, instead of final linked work. Sketching shows so much more emotion and flavor from the artist. If you do ever publish it, I want to buy an autographed copy from you! I loved reading this story!! I stumbled on it a while back and I just couldn't get enough. The ending was a total surprise! I really hope you continue it. I came across one of your short stories with Stumbleupon, and liked it so much I started working my way through the rest of them! You are a wonderful story teller, and an inspiration to me as an aspiring artist. Your art style is so expressive - all the characters have so much life and personality. After taking a few month break from WD I finally found time to remember to read the last few scenes. I just wanted to say that I loved the story and while I loved the roughs I would love to one day own a completed hard copy that I could buy from a book store. I would pay for it. It was quite a ride and I'll be sure to stop in on the blog from time to time. Thanks again from Australia. Wow. Totally devoured that apart! I love it! I hope you find the time to write a sequel, as I'd like to see "Vipey" defeated once and for all. 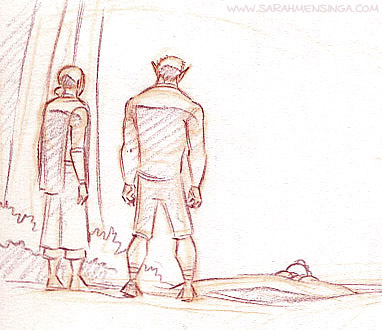 Looking at that last panel, I see Jase and Tearse almost as brothers. Weird, I know. I just found the Wellington Division last week. I real a lot of graphic novels online, and yours is definitely among the very best, both in terms of art and storyline. Thanks so much for posting it, and I will check back often for more of whatever product you're putting out. Wow! I've been reading WD all day and can I say I loved it! Thanks so much for sharing your work! because its amazing! You have such a talent for character designs and expressing emotion through simple sketches. I Loved every minute! I found Wellington Saga via StumbleUpon. I verry much enjoyed the artwork and story. Thank you for posting. Just finished reading the novel and it was wonderful. I am hook whatever you do count me along for the ride!